Chartreuse is a popular herbal liqueur produced by French monks from a 400-year-old recipe. Both Green Chartreuse and Yellow Chartreuse use a secret blend of 130 herbs and plants. The entire operation is still overseen by just two monks. It is a fascinating liqueur with a rich, long history. Today, Chartreuse is considered a staple in many bars and it is the foundation for a great variety of cocktails. Chartreuse pairs wonderfully with desserts and chocolate (especially Green Chartreuse). It is often enjoyed straight or on the rocks. 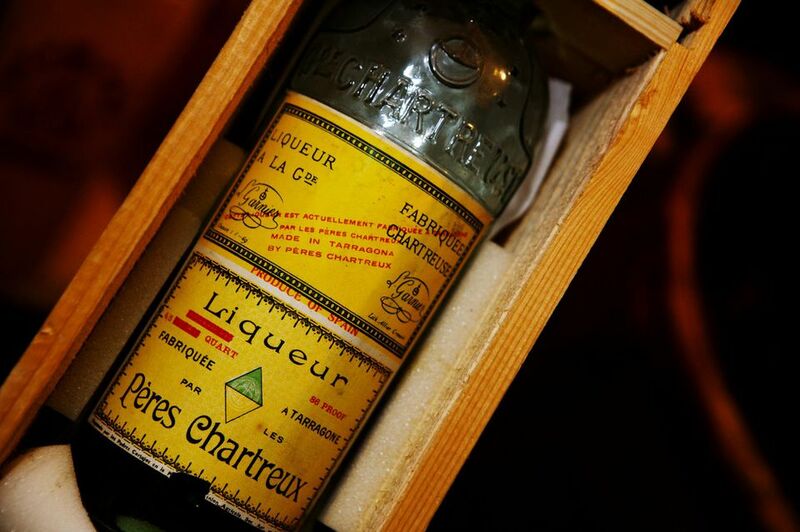 Chartreuse is an herbal liqueur produced by Chartreuse (or Carthusian) monks in the French Alps. With centuries of history, Chartreuse is one of the oldest and most mysterious spirits still available. It is an Old World liqueur that has remained true to its tradition in every sense. To this day, the distillation process is handled by monks at the Chartreuse Monastery in Vauvert and the distillery in Voiron. Only two monks from the order know the secret herbal recipe, which was laid out in a manuscript in 1605. The liqueur was originally created as an "elixir of long life" and, as is the case with many herbal liqueurs, it was intended as a medicine. The formula was perfected over the years and by 1737 the liqueur was released to the world (though distribution at this time involved a monk and a mule) in a form that is close to what we drink today. The elixir that would be known as Chartreuse was so tasty that people began consuming it as a beverage rather than taking it for its medicinal benefits. This caused the monks to reformulate the liqueur in 1764 into a more drinkable beverage that was 55 percent ABV, the strength of Green Chartreuse today. The French Revolution and Napoleon's reign nearly put an end to Chartreuse and the secrets were almost revealed. However, the manuscript was returned to the Carthusians in 1816. In 1838, they created Yellow Chartreuse, a sweeter, lower-alcohol liqueur. The Carthusians' troubles did not end in that century. In the early part of the 20th-century, the French government nationalized all distilleries and the monks were forced to move to Spain (Chartreuse from this time is known as “Une Tarragone”). The distillery failed under private business interests and the Carthusians returned in 1929 through the help of loyal friends, regaining full control of the liqueur, trademark, and distillery. Though there are two varieties of the liqueur, Chartreuse is one-of-a-kind in many aspects. You will not find another liqueur on the market that uses this particular blend of herbs and would be hard-pressed to find a liqueur that uses some of their production techniques. Due to this, there are no good substitutions for Chartreuse. The two monks charged with the duty oversee the entire production of Chartreuse. It begins in the monastery's herb room where the precise selection of herbs is bagged. These are then taken to the distillery and macerated with a neutral alcohol spirit, and then distilled. The liquor is then aged for five years in large oak casks. Both Green Chartreuse and Yellow Chartreuse obtain their signature color naturally through their ingredients. Unlike other green and yellow liqueurs, there are no artificial ingredients or colors added, only a small amount of sugar for sweetness. An outside company handles the bottling, packaging, and sales of Chartreuse. The profits help fund the entire monastery and allow them to continue their religious pursuits. Both styles of Chartreuse sell for $45-55 for a 750-milliliter bottle. They are also available in 375-milliliter bottles. Green Chartreuse is used more often than the yellow version. It is the original formula made from 130 herbs, plants, and flowers found in the French Alps. It is 55% ABV (110 proof) and has an intense floral and herbal flavor with hints of cloves, citrus, thyme, rosemary, and cinnamon. This herbal liqueur is surprisingly diverse when it comes to cocktails. It pairs best with whiskey though it does make an occasional appearance with other spirits. It is coveted by mixologists not just for the flavor, but as an alternative to mint and melon liqueurs when creating green cocktails. Yellow Chartreuse is also made from 130 herbs, plants, and flowers and was introduced in 1838. The difference between the green and yellow varieties is determined by the herbs used, although the process for distilling both is the same. Yellow Chartreuse is only 40 percent ABV (80 proof). It has a distinct citrus, violet, and honey taste accented by anise, licorice, and saffron. Yellow Chartreuse is finding its way into more cocktails every year. Modern mixologists enjoy the herbal blend and the lighter profile which pairs nicely with lighter distilled spirits as well as brandy and whiskey. Both Green and Yellow Chartreuse can be found in a bottling known as V.E.P. (Vieillissement Exceptionnellement Prolonge, translated to 'Exceptionally Prolonged Aging'). They are, essentially the same liqueurs that are hand selected by the Carthusians then aged for a longer period of time. These luxury liqueurs have an exceptional flavor similar to their younger counterparts but are markedly more mellow. Each bottle of V.E.P. is carefully closed by hand with a wax sealed cork, labeled with a wax Chartreuse seal, and placed in a wooden box marked with a branding iron. Bottles of Chartreuse V.E.P. can sell for over $150 per liter. As you might expect, these are best served neat or on the rocks.